Google’s official iOS client for the company’s social network, Google+, has finally received a refresh for the new iPhones, more than three months after the handsets have hit stores. In addition to native support for the new 1,334-by-750 and 1,920-by-1,080 screen resolutions of the new iPhones, the updated software brings a useful Share extension allowing you to send stuff to Google+ from other apps, the ability to vote on polls embedded in Google+ posts and bug fixes. To start sharing content directly to Google+ from other apps, you must first enable its system-wide Share extension. To do so, simply fire up any app which supports sharing via the multi-purpose iOS 8 Share widget, such as Safari. 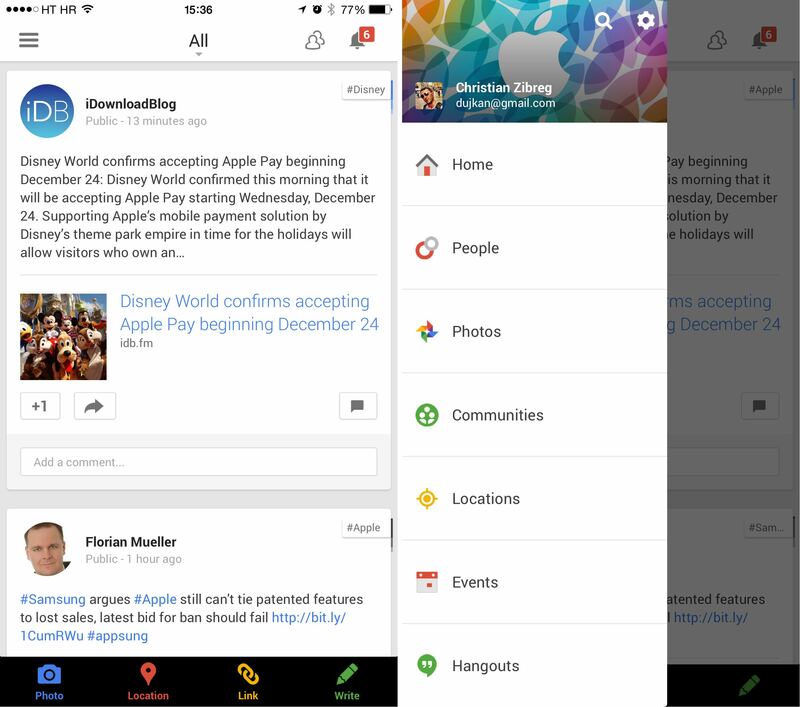 Now tap the in-app Share icon and choose “More” on the right in the list of sharing choices. Next, enable “Google+”, optionally rearrange your sharing services and tap Done when satisfied. The Share widget lets you choose your audience before posting based on your custom circles in Google+, provide an optional message and even choose a Google+ account to share to. Here’s sharing an iDownloadBlog article to Google+ from Safari. Again, direct sharing to Google+ works in any third-party app that supports iOS 8’s new Share menu so you can, say, post photos to Google+ directly from the stock Photos app and so forth. Retina HD resolution on iPhone 6 and iPhone 6 Plus. Vote on polls from people and brands. Easily share to Google+ from your device. The 117-megabyte universal download requires an iPhone, iPod touch or iPad with iOS 7.0 or later. Download Google+ free in the App Store.